"The Ultimate Query Experience for 4th Dimension"
PrintTwist is a command level PrintList™ Pro Competitor. With a few basic modifications, PrintTwist runs your existing PLP Code. PrintTwist can also run in "Wrapper Mode": as a complete wrapper around PLP code. PrintTwist is a fully open-source 4D Component. How often is my system flushing buffers? How many times, and when are my records being saved? What activity is being cancelled in transactions? LogTools tells you all this and much much more. BBBase is a free component that does lots of heavy lifting so you don't have to. 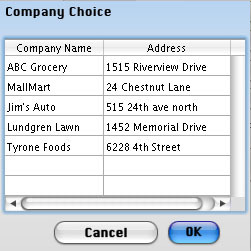 DisplayList4D is a DisplayList™ (by Automated Solutions Group) replacement for 4D 2004, based on 4D's ListBoxes.